I have asked Josh Stephens from Community Baptist Church and Biblical Counseling Alliance to share some of his top resources in various areas of counseling. Over the following weeks I would like to share those, interspersed with some of my own. Please share your own below in the comments. The order is alphabetical. See Addictions and Anger. Bridges, Jerry. The Pursuit of Holiness. Enlarged ed. edition. NavPress, 2016. Mack, Wayne A. A Fight to the Death: Taking Aim at Sin Within. P&R Publishing, 2011. Powlison, David. How Does Sanctification Work? Crossway, 2017. Scott, Stuart, and Zondra Scott. Killing Sin Habits: Conquering Sin with Radical Faith. Bemidji, MN: Focus Publishing, 2013. Tripp, Paul David. Awe: Why It Matters for Everything We Think, Say, and Do. Crossway, 2015. Piper, John, and David Mathis, eds. Acting the Miracle: God’s Work and Ours in the Mystery of Sanctification. Wheaton: Crossway, 2013. Whitney, Donald S. Spiritual Disciplines for the Christian Life. Upd Rev edition. NavPress, 2014. …grumbling, complaining, and self-pity are rampant and violent statements of unbelief. The real challenge of Christian living is not to eliminate every uncomfortable circumstance from our lives, but to trust our sovereign, wise, good, and powerful God in the midst of every situation. I complain. A lot. I complain verbally and silently. I am, at the core of my being, a person who is prone to murmur and complain. I am like those dear wandering Israelites in the desert, bless their hearts. Sometimes I just come out and say, “I hate this.” I could be talking about internal struggles with anxiety, or a time of marital stress, or having to have my Spanish corrected again. Sometimes I just dwell on it, enjoying the taste of imagined offenses affirming my bitterness toward someone else. In contrast, speaking truth to ourselves is something that every believer is called to do. Paul calls it “destroying arguments and lofty opinions raised against the knowledge of God,” and “taking every thought captive to obey Christ” (2 Cor 10:5). Truth speaking is reminding myself what I know is true during times when I don’t feel like it. But the struggle I have is that many times I haven’t fully recognized the struggle, or the needed truth until I start to talk about it. At times I feel like I need to voice my struggle and err on the side of sounding like I am complaining in order to take my anxiety into the light. It seems like only then I can own it and remember the truth. Saying “I am struggling with culture shock” has been a way for me to battle it. Saying, “I am struggling with bitterness” has helped me to pray for the person I punish in my mind. But then I feel like I am complaining. 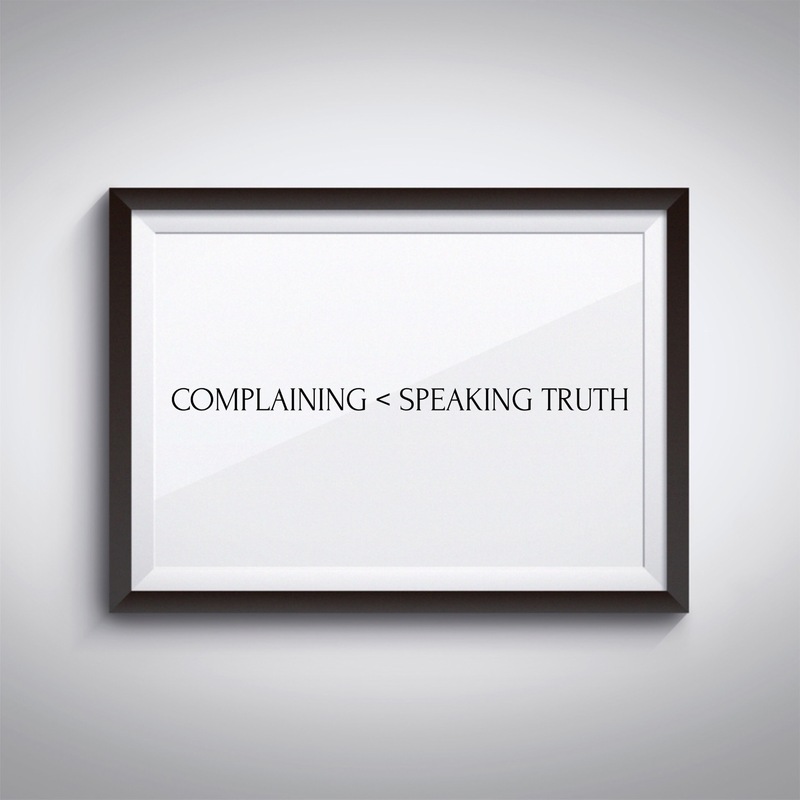 Both complaining and speaking truth to myself include recognition, and often times, vocalization, of adversity. But there is a difference. Complaining sees no hope, while truth speaking looks to Christ. Complaining seeks to affirm the reasons for my bad attitude. Truth speaking reminds myself for my reasons why I don’t need to complain. Complaining vilifies the circumstance, person, or object. Truth speaking reveals my own sinful heart and need of Christ. Complaining drives me deeper into the dungeon. Truth speaking leads me out of the cell. But just as there is a danger of really complaining when we are trying to speak truth, there is an equal danger of accusing someone of complaining when they are speaking truth. I think that if we were to have sat and listened to some of Psalmists write their poems, we would have tried to rebuke them. So, if you ever come across someone like me, someone who is struggling to believe the truths they know are true, will you help them? Help them by seeing their struggle and affirming that it would be hard given the circumstance they are in. Help them by hearing the truths that they are trying to believe, and affirming them if they are biblical. Help them by praying then, and regularly, for them. Help them by making it safe to be honest about their struggle. Those were my initial reactions to the courses we were required to take to complete our clearance process with BMM. Every missionary is required to take two classes on Prevention of Sexual Abuse. One is an in-house seminar on problems and procedures, and the other is an online course. It is hard to hear statistics like “One in four women and one in six men have been or will be sexually assaulted in their lifetime” (Holcomb & Holcomb, God Made All of Me). A website devoted to ending child sexual abuse. They offer articles, statistics, and a 2 hour course which helps to “raise awareness of the prevalence and consequences of child sexual abuse by educating adults about the steps they can take to prevent, recognize and react responsibly to the reality of child sexual abuse.” While it is not a specifically Christian organization, they are doing a good job at informing us of the dangers of abuse and opportunities to eliminate it. A children’s book which helps parents talk with their 2-8 year old children about their bodies and how to protect them. I would encourage every individual to take the Darkness to Light 2 hour course. I would encourage every family with young children to purchase Holcombs’ book and read through it. I would encourage every church to purchase Reju’s book and teach a class for leaders, teachers, and families on the principles. *This is the third of four books in the Wingfeather Saga, a collection for readers of all ages. I have been convicted about how I use my words. The conviction is part of the reason I picked up this book, and more conviction came as I read this book. I criticize because I think I know better. I mock because I think I could do better. I belittle because I think I am better. These ought not to be so. They are symptoms of a sinful heart. In “Resisting Gossip,” Mitchell defines gossip in this way, “Gossip is bearing bad news behind someone’s back out of a bad heart.” And while it is tempting, pervasive, and easy, there is hope in Christ for those who gossip and those who are hurt by it. I would recommend “Resisting Gossip” to individuals and small groups in personal reading, Bible studies, or church groups. It will be a challenge whether you have been on the receiving end of gossip, or the carrier. It will help to define, spot, and deal with gossip in your own heart and in your circle of friends. Click here to read a full review, and consider picking up this short book and reading through it with a friend. Mitchell, Matthew C. Resisting Gossip: Winning the War of the Wagging Tongue. CLC Publications, 2013. Lewis, C. S. Mere Christianity. New York: HarperCollins, 2001.
if there isn’t something greater to give your life to? why you get so upset about little things? why it is so hard to forgive sometimes? Read this book: Tripp, Paul David. A Quest for More: Living for Something Bigger than You. Greensboro, NC: New Growth Press, 2008. Point: When we are the center of our solar system we live within a shoebox. When our glorious God is the center of all that we are we are pulled into a universe full of his glory. Read the full review on Amazon by clicking on the book title. Let us know if it is helpful. It is on sale on Kindle now. Definitely worth it. Part of the “How Can I Change?” series. See the overview, sorrow, accountability, the church, radical measures, gratitude, confession, humility, spiritual disciplines, Scripture intake, Scripture intake 2, and prayer. What is the passage saying? How is it connected to grace? Example: Your friend sits next to you regularly in church. You try not to be distracted, but you can’t help but lose concentration when he seems more interested in his phone than in the service. There is little to no singing. When the Scripture is read or prayer is made, you can actually feel the restlessness creeping down the pew. The listening to the preaching begins well, but soon the Bible on their phone is switched out to check on other pressing matters involving Facebook, Twitter, Fruit Ninja, and Weather. When you talk about church with him, you regularly hear, “I just never get anything out of it. I’m just not being fed.” How do you think a proper attitude of worship might change his following of Christ? Example 2: Your friend reads her Bible regularly but she seems bored. It is a duty. There is no joy in doing it. What change in mindset could transform her personal time in the Word? What is one thing you could do in order to prepare your mind to accept the revelation? What is one step you could take to respond to revelation that incorporates your accountability partners or mentor? “There are some graces and blessings that God gives only in the “meeting together” with other believers” (Whitney, 92). Mahaney, C.J., and Rovin Boisvert. “Chapter Six: Tools of the Trade (2).” In How Can I Change? : Victory in the Struggle Against Sin, edited by Greg Somerville, 69–82. The Pursuit of Godliness. Gaithersburg, Maryland: Sovereign Grace Ministries, 1993. Piper, John, and David Mathis, eds. “Appendix: Conversation with the Contributors.” In Acting the Miracle: God’s Work and Ours in the Mystery of Sanctification, 139–62. Wheaton: Crossway, 2013. Whitney, Donald S. “Chapter Five: Worship.” In Spiritual Disciplines for the Christian Life, 85–98. Colorado Springs: NavPress, 1997.